Bhopal : Bhopal will attract global spotlight when it will host the 10th Vishwa Hindi Sammelan (aka World Hindi Conference) on 10th of September. A three-day conference, an event organized by Ministry of External Affairs, Government of India will work in partnership with the Government of Madhya Pradesh. Bhopal got nominated as a host for the 10th edition during the 9th World Hindi Conference held in Johannesburg, South Africa in September 2012. The tradition of the World Hindi Conferences began with the first conference having been organized in Nagpur in 1975. Since then, these conferences have achieved a global profile and have been able to gain a likable momentum on their own. The subsequent nine World Hindi Conferences were organized in different world cities- twice in Port Louis (Mauritius), Nagpur and New Delhi (India), Port of Spain (Trinidad and Tobago), London (UK), Paramaribo (Suriname), New York (USA) and Johannesburg (South Africa). These Conferences have always attracted a galaxy of renowned scholars and followers of Hindi worldwide. Each Conference revolved around a specific theme like Vasudhaiv Kutumbakam, Apravaasi Bharateeya Aur Hindi, Hindi Aur Bhavee Peedhee, Vishwa Hindi : Nai Shatabdi Ki Chunoutiyan, Vishwa Manch Par Hindi, Bhasha ki Asmita Aur Hindi Ka Vaishvik Sandarbh etc. 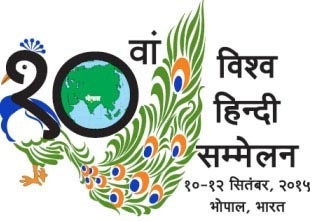 The 10th World Hindi Conference will focus on contemporary issues and will promote discussions on ways of expanding the horizon and usage of Hindi in areas of science and technology, Information Technology, Administration and foreign policy, law, media etc. The Vishwa Hindi Sammelan will be held at Lal Parade Ground in Bhopal. MP State government being the local organizer, MP Chief Minister Shivraj Singh Chouhan will facilitate as Chief Patron. Makhanlal Chaturvedi National University for Journalism and Communication will be the partner organization for this Conference. CM Shivraj Singh Chauhan has been personally involved in close monitoring of final preparations to this mega world event. Minister for External Affairs, Sushma Swaraj, who happens to be the Chairperson of Advisory and Programme Committees informed during official launch of 10th Vishwa Hindi Sammelan here in Bhopal that the main theme of Conference will be ‘Hindi Jagat: Vistar evam sambhavnayein’ (World of Hindi – expansion and scope). She said that the three-day conference will have 28 seminars on various aspects including the failing language standards in Hindi journalism. Minister of State for External Affairs V.K. Singh was also present in the meet along with Higher and Technical Education Minister of MP, Umashankar Gupta. Prime Minister Narendra Modi will inaugurate ‘Vishwa Hindi Sammelan’ on 10th. The ceremony will be concluded by Home Minister Rajnath Singh on 12th. Ms. Swaraj launched a website http://www.vishwahindisammelan.gov.in where participants can register themselves for the event. hi there, fantastic report, i just like this specific site and also i would like to pay a visit to it. i have a query for you ; wherever do i locate a pictures just like this? facts. Thanks for providing this kind of information.